In the past several year’s men have become more ‘cosmetically conscious’ by being more involved in their grooming habits. Between pressure at work and in the dating field to look young and refreshed, men are increasingly venturing beyond massages and exploring anti-aging treatments. These treatments are becoming viewed by men as a method of self-enhancement, like eating well, wearing nice clothes or going to the gym. Men are still very gun-shy but willing to try treatments that are not invasive, which will not require too much time, recovery and side effects. This transition is slowly becoming a trend with all age groups because of social media and knowing women who’ve done similar procedures. We offer complimentary consultations for those clients wanting to learn more about what steps they could take in rejuvenating their natural look and feel. During your free consultation with one of our licensed aestheticians, they will help you identify your areas of interest and provide recommendations. We offer facials for men who enjoy all kinds of lifestyles and have different needs. They are entirely personalized depending on your skin type (i.e. dry, oily), address problem areas like blackheads, and cater to conditions like eczema or rosacea. There are facials that treat roughened and sun-damaged skin for guys who spend a lot of time in the outdoors. Moreover, men who live and work in polluted, dirty cities often need deep-pore cleansing and exfoliation. Of course, just like the women in their lives, men experience dry skin. Hydrating facials, such as oxygen facials, can work wonders on a guy’s parched face–and help him look years younger. Regular facials can unclog pores, remove dead skin, and prevent or treat acne in ways you can’t really achieve with your bar of soap. “Beard facials” can even moisturize your facial hair, hydrate the skin beneath it, and help free ingrown hairs. The exfoliation and hydration after a facial immediately make your face look refreshed. It also triggers the skin’s repair system and spurs collagen production, which is that structural protein in the dermal layer that keeps skin looking tight and youthful. Hydrating restores water to the skin, which temporarily plumps it and smooths fine lines. It also provides a barrier for dry skin, which can trigger sensitivity. Together, exfoliating and hydrating gives the face a glowing appearance. Botox & Dysport cosmetics can diminish moderate to severe facial wrinkles between the brows and along the forehead. They can also be effective for crow’s feet and other areas that respond to these popular treatments. Typically, they only take a few minutes and can be scheduled during the lunch hour. Botox & Dysport are minimally invasive and administered by our nurse injector Sara Jaber Reese. The results can last 3-6 months and will need to be repeated if you wanted to maintain your results. According to the American Society of Plastic Surgeons, dermal fillers, such as Restylane, Restylane Lyft, Juvéderm XC and Radiesse, can help diminish facial lines and restore volume and fullness in the face. Our nurse injector uses fillers to plump thin lips, soften facial creases and wrinkles, and improve the appearance of scars and more. The changes can be subtle or more dramatic depending on how much filler is used. Dermal fillers are a quick and convenient treatment. You may experience some temporary redness, swelling and possible pinpoint bruising from the needle. We suggest not doing right before a big event, meeting or date. You should give yourself at least a week just in case you get a bruise or need additional treatment. Most of the time we combine dermal fillers with Botox injections for optimal anti-aging results. Sometimes a peel and a bit of water aren’t enough to undo all the damage inflicted by time. For more drastic results, we recommend microdermabrasion, a treatment that uses a diamond tip head with vacuum to exfoliate and improve the texture of the skin, and can even treat minor superficial acne scars. With the dead cells out of the way, the skin is able to absorb skin care products more effectively. It also offers a delayed benefit by increasing cell renewal over time. This an easy treatment with minimal to no downtime and makes the skin look good immediately. Sometimes our skin needs a little more attention, so our aesthetician may refer you to Dr. Paul Sabini, our facial plastic surgeon for dermabrasion. To understand the difference between the two, let’s use mechanical terms. Dermabrasion is like sanding the skin while microdermabrasion is like sandblasting very gently to remove the outermost layer of the skin. Dermabrasion may require anesthetics and will carry some recovery time, where the treated area will look red and inflamed for a few weeks. If peels and microdermabrasion aren’t enough to undo decades of neglect, you can dig a little deeper with microneedling. Microneedling is a safe, chemical-free treatment to stimulate collagen growth. Each tip contains 36 gold tipped insulated needles that create multiple mini microchannels in the skin which spurs the body’s healing process to fill them with collagen. When combined with radio frequency, it becomes the newest revolution in contouring and tightening for the face, neck, hands and body, producing immediate results, minimal discomfort, virtually no pain, and no downtime. You will see immediate results after one treatment but for the most optimal results and benefits, we recommend a series of at least three treatments spaced 4-6 weeks apart, with maintenance treatments throughout the year. Special package pricing is available. Each treatment can take up to an hour and possibly longer if multiple areas are being treated. We request you arrive 30 minutes prior to your treatment to apply a topical numbing agent. Your face should remain clean following the treatment since we have created small microchannels that could be clogged with dirt, debris, and makeup. We recommend waiting a full day before resuming makeup and to avoid certain topical creams such as glycolic, retinoids preceding, and following treatment for at 7 days. To learn more and find out if the Vivace Experience is right for you to schedule a complimentary consultation with one of our licensed aestheticians. CoolSculpting is a process that takes advantage of the fact that fat has a slightly lower freezing point than water. The applicator uses vacuum pressure to target fat cells—you’ll feel a cold sensation for the first five minutes, then go numb—which get frozen, then eliminated naturally by your body (apoptosis/cellular death). 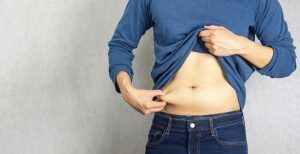 Coolsculpting is not a weight-loss treatment, but ideal for guys who are in shape and exercise, but have trouble spots or stubborn fat pockets that exercise and diet will not address. Treatment times vary, each cycle can last 35 to 45 minutes but if multiple areas are being treated it can take a few hours. You will start seeing, or more so feeling results in the first four weeks. At three months is where most of the results are seen. Some clients have reported continued changes after the three months. The treatment is limited, you will only see a 20 to 30 percent improvement in your bulge after one treatment. Multiple treatments may be recommended to achieve your desired result. Before deciding on Coolsculpting we recommend having a consultation with our board-certified plastic surgeon, Dr. John Roussalis to discuss all your options including liposuction or abdominoplasty. These procedures are surgical and will require sedation and have a longer recovery, but the results are more substantial and immediate. In the end, it may even be more cost-effective. We can target multiple forms of redness, which typically includes pink discoloration and dilated capillaries with our V Beam Perfector. This particular vascular laser targets hemoglobin in a blood vessel and creates heat to close the vessel off so it eventually goes away. There are no health risks since the targeted vessels are “superficial and not medically necessary.” You’ll see the best results after three to five treatments, spaced four to six weeks apart. Clear+Brilliant refreshes your skin from the inside out, but won’t cause any major swelling or scabbing, like Fraxel, another popular resurfacing laser. We refer to Clear+Brilliant as a “Baby Fraxel”. The laser delivers heat within the skin, which triggers damage, then subsequent replacement of damaged skin by microscopic exfoliation (via tiny scabs that eventually slough off). Following your treatment, your skin will feel like sandpaper for a few days and look red for a couple of hours (as if you’ve been in the sun, but nothing dramatic). You’ll see results after one treatment, but recommend four to five treatments four to six weeks apart. Ultherapy is the only non-invasive, non-surgical skin tightening treatment approved by the FDA for lifting the skin on the neck, chin, and brow. Ultherapy works by targeting deep layers of skin tissue, ensuring that no marks are left behind by your procedure. The ultrasound imaging allows our technician to tailor the treatment and make sure the appropriate tissue is targeted. It is a very safe treatment but you may experience some redness, slight swelling, and tenderness to the touch for a few hours following your procedure. In just 2–3 months, the time it takes for collagen to rebuild resulting in a more youthful, refreshed, appearance. Nobody will know because the change is gradual and natural. A good Ultherapy candidate has mild to moderate skin laxity where the skin has begun to feel and look less firm. 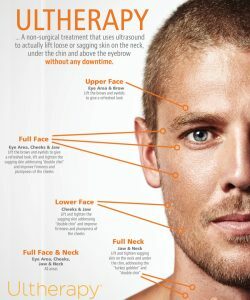 Experiencing a lowered eyebrow line, loose skin on the neck, sagging under the chin, or lines and wrinkles on your chest? Schedule a complimentary consultation with our Ultherapy expert Sara Jaber Reese, RN to learn more and find out if you are a candidate. Manscaping is simply getting rid of unwanted and unsightly hair. You don’t have to remove it all, just treat those areas that are just out of control. We treat the chest, back, arms, legs hand, feet, toes, knuckles nose, ears and more. Our licensed aestheticians can treat the unwanted hair quickly and privately with laser hair removal in our state of the art medical spa. that were in their growth stage are now in their dormant or dying stage. 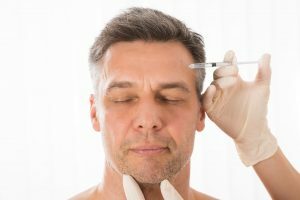 Overall, if you follow all the rules and get your treatments in the recommended timeframe, you can see anywhere from 50 to 85 percent permanent hair reduction. Most often, we treat men for their backs and chest. It helps them feel more confident in their skin. Laser hair removal can help treat conditions like PFD, pseudofolliculitis barbae or recurrent folliculitis. Pretty much anyone who can’t tolerate shaving and waxing is an ideal candidate for laser. It doesn’t hurt—a lot, it’ll depend on your pain tolerance, but for the most part, it’ll feel like a pinprick or a rubber band snap. Our Gentle Max Pro hair laser system provides super-fast, comfortable treatment with it’s patented Dynamic Cooling Device. It minimizes discomfort by releasing a quick burst of liquid cryogen before and after each laser pulse. There are lasers that work best for light skin, and others that are better suited for dark skin. The ideal candidate is someone who has fair skin and dark hair follicles. People with red, very blonde, and white hair won’t see results from laser hair removal and shouldn’t be treated. People with fair skin will fall under skin type 1, 2, and 3, which will respond best to an Alexandrite laser. It has a short wavelength (755 nanometers), which is easy on the skin, and effective on light hair. Those who have olive/dark skin will fall under skin type 4, 5, and 6 we would use a wavelength that bypasses the epidermis and has a long pulse, like the Nd:Yag laser; it has a wavelength of 1064 nanometers and is very safe on the skin. Before the appointment, you should shave the area you’re getting treated. You want to have short hair so when the light goes through it, there’s enough left to hit and damage the follicle. You should not be tan or use a self-tanner at least three weeks before your scheduled treatment. This is one of the reasons we see a spike in laser hair removal during the winter months. We offer special packaging pricing when you treat multiple areas. To learn more call and schedule a consultation. Our IPL device uses a combination of radio frequency and broad spectrum light to safely fade or eliminate sunspots, facial flushing, broken capillaries, freckles, redness and more. The face, neck, chest, arms, and hands are the most common areas where this treatment can be utilized but areas like the back and legs can be treated. IPL works best on lighter skin types that have not been tanned. We recommend avoiding sun exposure during times of this treatment. Typically, treatment protocol recommends 3-5 treatments, 4-6 weeks apart to obtain the best results. The total number of treatment sessions will vary depending on the condition of your skin. There is little to no downtime following this procedure. You may see an increase in redness directly following your treatment but this subsides within a few hours. You may see an increase in pigmentation following your treatment since the underlying sun damage in the skin is brought to the surface. Post-treatment you will notice tone and texture improvements because of increased levels of beneficial collagen and new healthy skin cells and reduction of sun damage.